Looking for a complete diversion from your average death metal endeavor? 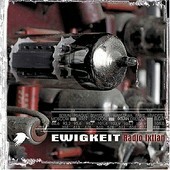 Then look no further than the cosmic chaos caused by the multi-talented Mr. Fog and his project, Ewigkeit. This progressive excursion from the typical grinding sound of death metal has its feet way off the ground and into another universe, as the band's name (German for eternity) suggests. Much like fellow multi-tasker Devin Townsend, Mr. Fog plays most of the instruments himself and carries a unique vision to heavy music that encompasses everything from Pink Floyd to KMFDM to Opeth, often in the same song. tracks like the folk metal stomp of "Strange Volk" and the doom-laden dance rock of "esc." are just some of the more eclectic examples from this pioneering piece of work. Radio Ixtlan contains nine ambitious tracks that combine synthesizers, shred guitars, and a slew of samples to create its own musical realm where rave meets death metal at a space rock showcase. For those stuck in a metal rut, become unbound by the sounds of Ewigkeit.